China has leveled up its gaming industry this year, from creating internet café hotels to recognizing eSports player as a new profession. The market size of China's eSports industry soared to 94 billion yuan ($13.99 billion) in 2018, surpassing that of previous leaders the US and South Korea, according to the latest statistics from Shanghai-based consulting company iResearch. 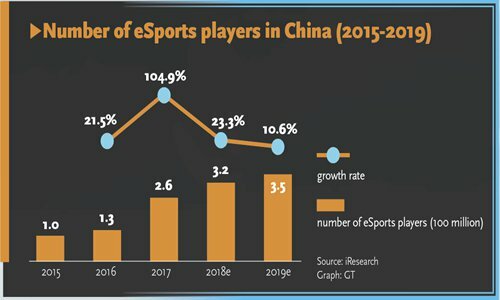 The major source of eSports revenue in China comes from spending on eSports games, while revenue from the eSports ecosystem - including earnings by eSports clubs, game livestreaming and competitions - has seen rapid growth in recent years, Li Yiyang, an eSports consultant at iResearch, told the Global Times on Thursday. "Currently, both the market atmosphere and state policies are much better than before. At least for now, we have not seen any hindrance from the policy side," Li said. "I would say the government takes a supportive attitude toward developing the country's eSports industry." The victory by Invictus Gaming (iG) in the League of Legends World Championship in November 2018 has put China's professional gaming on the map. The popular eSports club, supported by Wang Sicong, the son of Wang Jianlin, one of the richest men in China, became the Chinese mainland's first team to win the competition by beating out European team Fnatic 3-0 in Incheon, South Korea. eSports were approved as an official sports activity by the Chinese government in 2003. In 2018, multiple cities such as Shanghai, Hangzhou and Hong Kong all made efforts to develop their local eSports industries as part of their development strategies. Seeing great potential in developing the eSports industry, investors hope to grab a share of the pie by establishing eSports clubs and taking top gamers to participate in international competitions. The popularity of top eSports players and clubs soon gained wide attention. Topics about eSports clubs and popular gamers regularly appear on top searches on China's Weibo microblog platform. As a result, some popular eSports players enjoy the same admiration - and wealth - as pop stars. An industry insider told the Global Times that the average income of top famous eSports gamers can reach around one million yuan per year. One of the world's top Dota players, Xu Zhilei, also known as "BurNIng," told the Global Times he used to earn only 1,000 yuan per month in 2008 from gaming, nothing compared to what today's eSports players are making. In addition to their salaries, players earn huge amounts in tournament bonuses. For example, the prize for first place in The International 2018 (Ti8), the largest festival for fans of the game Dota 2, was $11.19 million, with second place taking $4.07 million, according to Valve Corporation. However, the much-hyped industry is at risk of unhealthy future development. "eSports have become a game of capital recently. Like other traditional sports programs, if you want the team to achieve a high score, the fast way is to invest a great deal of money to attract the best players," said Xu Xiaoyun, the competition management head at Shanghai-based ViCi Gaming (VG) eSports club. The rapidly-growing investment may lead to non-standard industry development, such as malicious pricing for top players and difficulties for them to move between clubs freely, industry insiders told the Global Times. Xu also noted some of the financing problems are caused by certain game companies. "Some game publishing companies pay more attention to players, instead of clubs," he added, giving the example of Dota 2, which allows the value and the accumulated score of an athlete to follow that player rather than his club in the Ti match. "Under these circumstances, if the best player leaves my team, I have nothing. As a result, what clubs are doing is trying their best to bind excellent players to clubs and sign contracts with them for as long as possible," Xu told the Global Times. Li echoed Xu, saying the definition of professional eSports in China is not clear enough. "As long as you form a club of four to five people and take them to participate in a competition, they could be called professional eSports players," Li said, noting there may be hundreds of such clubs in China. "But there are only 30 to 40 top-level eSports clubs which cut a figure and get stable and outstanding results in competitions," he noted. 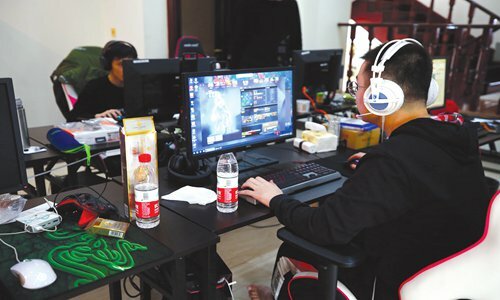 The current problems reflect the fact that the popular eSports industry has not yet created a mature business model to earn profits, several industry insiders told the Global Times. "If we want to change the situation, we should standardize the industry. For example, we need an organization like the National Basketball Association (NBA) to oversee players' contracts with clubs and transfers between clubs," said Xu. He acknowledged some eSports in North America have tried to incorporate an NBA-style training and operating model for the eSports industry, adding that VG club is striving to learn from the mature clubs. In VG's Shanghai headquarters, there are psychological counselors, nutritionists and massage therapists to serve the players. Xu said the club is trying to provide comprehensive help to its players. Especially before big competitions, many eSports athletes may face huge pressure, which can influence their health and scores. Cervical spondylosis is one of the occupational health conditions eSports players face, which can be treated with massage. Other ways the eSports industry could learn from the NBA include raising revenue from ticket sales and rebroadcast rights. According to market survey company Newzoo, the total audience for eSports competitions reached 385 million people in 2017, with 51 percent coming from the Asia Pacific region, surpassing that of Europe (18 percent) and North America (13 percent). An industry insider told domestic media thepaper.cn that no traditional sports competition held in the National Stadium in Beijing, also known as the Bird's Nest, has broken the young attendance numbers for eSports matches so far. Pan Fei, competition management manager at PSG.LGD Gaming club, told the Global Times the club currently has five revenue sources: competition prizes, sponsorships, offline revenue, popular players' events and the "fan economy." Pan noted that almost all big eSports clubs in China are striving to develop related industries in order to balance the clubs' expenses and revenues. "At present, few eSports clubs are making money in China," he said. Li agreed the potential for monetization of eSports clubs is not as good as traditional sports clubs, but their growth has accelerated in recent years, which is a great achievement for the industry. He said related industries such as building offline eSports venues, developing eSports education and commercial complexes for eSports fans will have great potential for the foreseeable future.